Woah Squadies, I can’t wait to let you in on a little Lean Secret! I know I haven’t posted about it a lot, but one of my (and Brodie’s) FAVOURITE cuisines is Indian (or as we call it, Lean-dian). Whenever we order in, (Hudson prefers to eat at home) we ALWAYS make sure to order a dish of Butter Chicken – it’s just the best! As you all know Squadies take-out foods can be filled with unwanted or non-lean sneaky ingredients, so I figured it would be WAY WAY better to make it myself at home! This recipe I am about to share (just like ALL of the LEANSQUAD recipes) is super easy, super tasty, and super healthy! The best part about this Lean-dian Butter Chicken is that it is so tasty and filling, but also extra LEAN. The entire dish is super satisfying and warming, which is perfect for a cold winter day. First things first, I used a diced-up chicken breast to make sure I had a great source of lean protein and I stir-fried it with a few tablespoons of ghee. The lean-mazing benefit of ghee is that it is packed full of fat-soluble vitamins, islactose free and has a higher burn temperature for cooking! The added lemon juice is agreat wayto jumpstart your digestive system and get the body burning while chowing down/ diving into? on this LEANMAZING dish! Finally, it wouldn’t be a proper Lean-dian dish without a healthy amount of spice! Add a little bit of paprika, curry powder, and chili powder to the party and give your taste buds a little treat while kicking your metabolism into overdrive. After you’re done cooking up the tasty butter chicken, put it over a bed of cauliflower rice to make this the LEANNEST Lean-dian dish you’ve ever tried! Oh, and also – feel free to cook along with me in Ep 4 of COOKING LEANNESS!! Heat up a large skillet until it’s very hot. Add 1 tablespoon of the ghee and spin it around the pan, coating the outside. Add 1/2 of the cut up chicken and stir fry with the ghee for 4 minutes. Add the remaining tablespoon ghee and stir fry the other half of the cut up chicken until browned. Remove chicken (you can place with other 1/2) and set aside. Pour out used ghee. Turn down the heat on the pan to medium-low. Add 1/4 cup ghee to the pan and melt. Add garam masala, sweet paprika, coriander, ginger, chili powder, and curry power, and stir fry for 1 minute. Put all of the chicken back into the skillet and mix it around to coat in the spices. Serve over cooked cauliflower (green giant is my favourite) rice with cilantro to garnish. **After you’re finished, place leftovers in Tupperware and store in the fridge for 2-3 days. 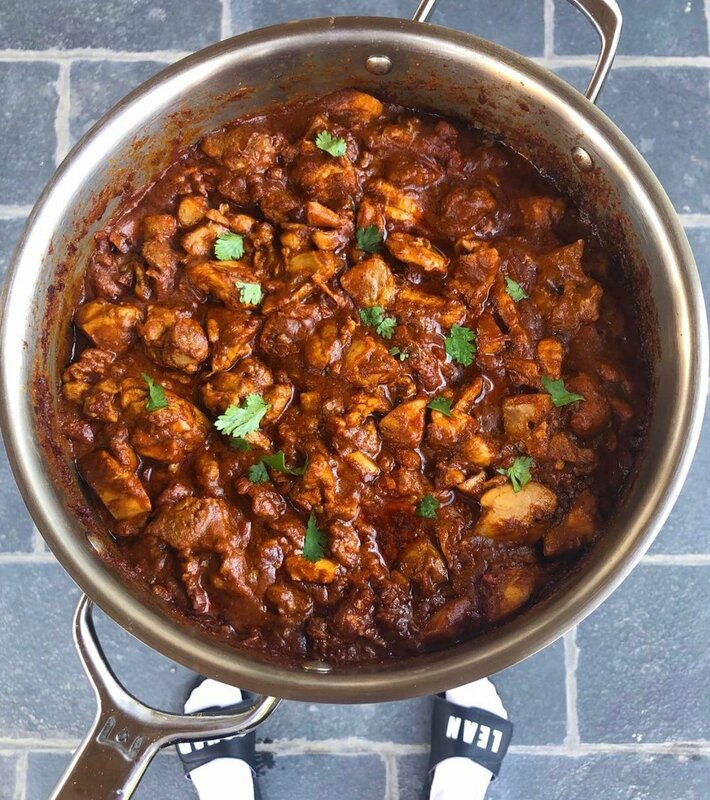 Give this Lean-dian Butter Chicken some love and let me know what you think! !